There's a very famous scene from the movie “A Few Good Men” where Colonel Nathan R. Jessup portrayed by Jack Nicholson screams 5 famous words: "You Can't Handle The Truth." That's the question I would have us reflect on today. Can we handle truth? I say no. Why? Because I believe TRUTH IS LIKE A FIRE... It's like a fire that never goes out. People can try and ignore it, some even try and extinguish it, but honest encounters with it leave us changed. The truth of the person of Jesus Christ isn't something that can be handled, manipulated, or transformed. No, truth transforms us. It's like St. Paul who when confronted face to face with the truth experienced a dramatic conversion of heart, it's like the disciples on the Road to Emmaus whose hearts were burning in the company of Truth. It's like our Gospel today, where the man with a withered hand was healed by his encounter with Jesus Christ, truth everlasting himself. The Pharisees can't handle this miraculous truth before his eyes, so they plot against Jesus. Now that leads us back to today. Today on the anniversary of Roe v. Wade, we find ourselves in a battle. Pro-Life vs. pro-choice, culture of life vs. culture of death. But we must remember it isn't our war. Like David in our first reading from Mass today we remember that: “The Battle is the Lord's.” And since it is the Lord's battle, Truth is on our side. And we see this happening. Too often our opponents have hardened their hearts, and they ignore the truth that is presented before them: the truth that every fetus is a child, and that every child is precious. They try and manipulate the situation and try to define children as just a clump of cells, but the truth is that clump of cells is truly alive, and truly a human being. Like we see in our Gospel today, our enemies in this movement try to confuse things, try to redefine things, but in the end, the Truth wins. So, even if the newspapers, and all the big news companies ignore that 600,000+ people are marching on Washington today. Even if they ignore the fact that 50,000+ will march through the streets of San Francisco on Saturday. It is okay. They can't handle it. BUT one by one we march, and one by one we'll convert hearts. One by one, we will share with others the joy and peace and freedom of the truth. One by one we will share with others the truth that Abortion hurts women, the truth that abortion hurts families and the truth that abortion companies are simply about making money. Look at the incredible work that the Knights of Colombus and countless pro-life organizations have been doing. 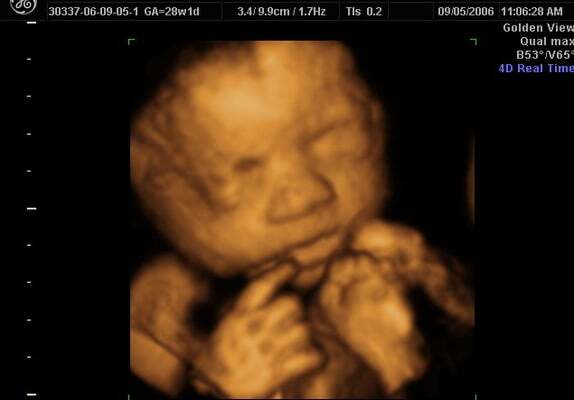 Over the past decade they have been funding ultrasound machines for pro-life pregnancy clinics so that mothers can see the truth that they have a child alive and growing in their wombs. In this way, mothers can joyfully encounter the truth, that they are co-creators with God in bringing about a unique, irrepeatable, irreplaceable human life into this world. Likewise, as members of the Body of Christ, we also know that there is a powerful healing that truth provides. Like bringing wounds to the light so that they can be properly treated, truth allows hearts and souls to be healed because it forces shame and suffering out of the shadows. There IS life after abortion, God does forgive, and he wants to heal those who have been hurt by the pains of abortion. We must share this truth with others. I was sitting in O.R. 's offices when I noticed a fetal development poster. The progression was so obvious, the eyes were so sweet. It hurt my heart, just looking at them. I ran outside and finally, it dawned on me. 'Norma', I said to myself, 'They're right'. I had worked with pregnant women for years. I had been through three pregnancies and deliveries myself. I should have known. Yet something in that poster made me lose my breath. I kept seeing the picture of that tiny, 10-week-old embryo, and I said to myself, that's a baby! It's as if blinders just fell off my eyes and I suddenly understood the truth — that's a baby! I felt crushed under the truth of this realization. I had to face up to the awful reality. Abortion wasn't about 'products of conception'. It wasn't about 'missed periods'. It was about children being killed in their mother's wombs. All those years I was wrong. Signing that affidavit, I was wrong. Working in an abortion clinic, I was wrong. No more of this first trimester, second trimester, third trimester stuff. Abortion — at any point — was wrong. It was so clear. Painfully clear. Truth, when we allow ourselves to genuinely encounter it, it changes us.The truth is so powerful it was able to transform the heart of Jane Roe herself. So, my dear brothers and sisters, let us go out there and share the truth. Let us convert the world with it, because the world can't handle the truth.